This package contains 12 spools of vibrant, fun colors to make any design remind you of a sunny day. 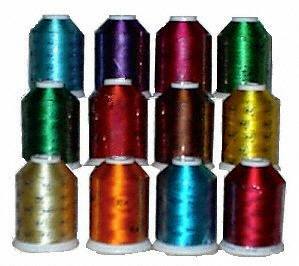 Each spool contains 1,100 yards of ultra high sheen Rayon embroidery thread. This set of colors will bring the brightness of summer to your embroidery! Save $11.89 over the per-spool price - that's like getting 2 spools for free!